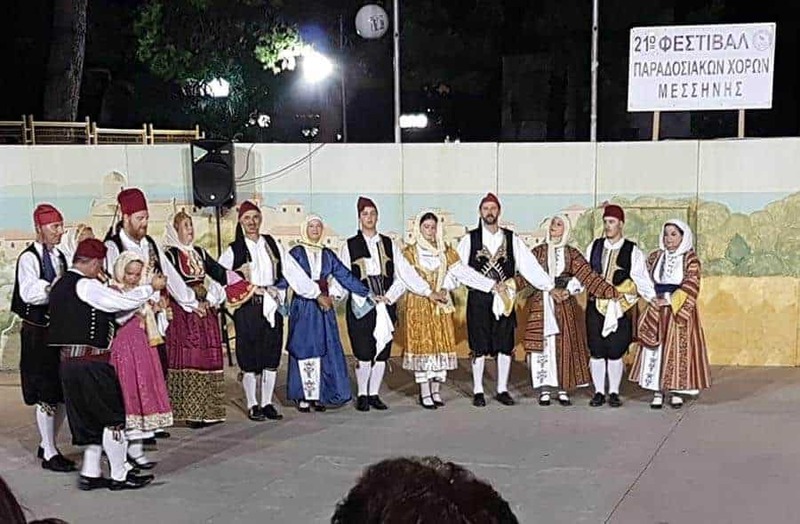 This summer the Koroni Dance Group I’m a member of (Politistikos Syllogos Koronis) took part in three performances – two in Koroni in June & July and one as guests of Messene in August. Here we are in a rather blurry photo, along with the Mayor at the end of the main summer performance in Koroni. 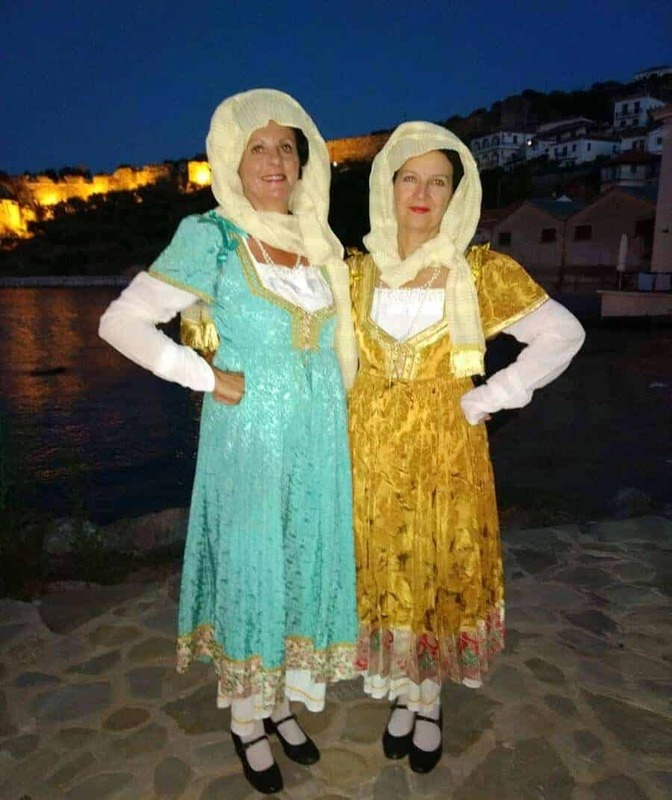 For the first performance, on the very windy evening of 23rd June, we danced on a stage near Moxlos Plateia, with the beautiful backdrop of Koroni castle. It was the evening of the traditional celebrations of Aghios Giannis Rigana. Battling the wind, we performed a series of dances from the Aegean, dressed in a variety of traditional costumes from the area. These two are typical of the island of Paros. I loved my gold frock! The summer dance costumes are chosen by our tutor and hired in from professional costumiers for each performance – hence we get to wear a lot of different outfits! 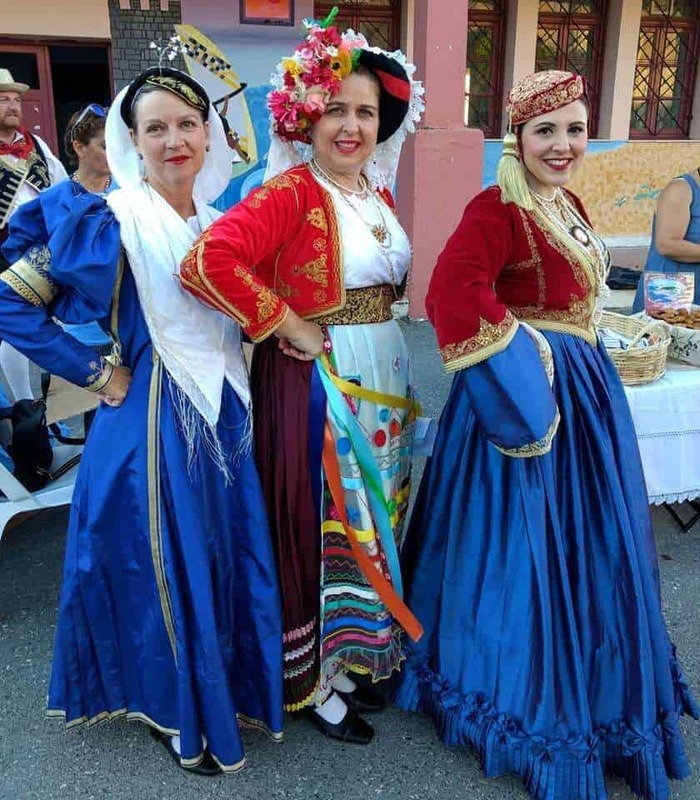 For regular events such as Ochi Day and Greek Independence Day, we will usually wear the local ‘Kalamatiano’ costumes of blue and red which are owned by the Group. 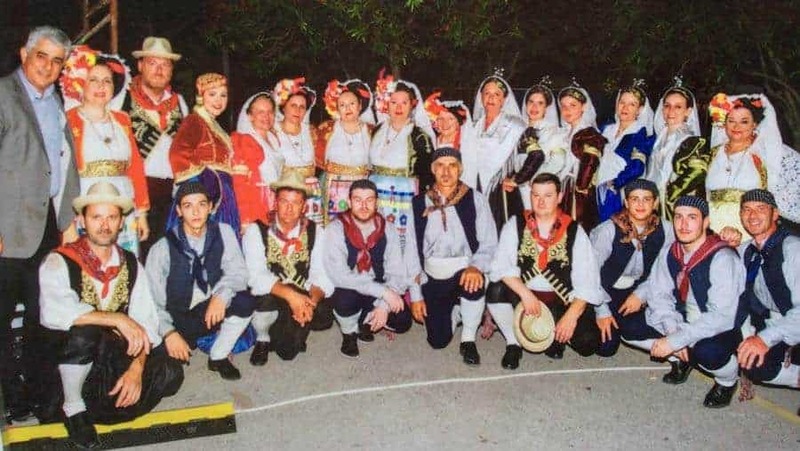 Our second Koroni performance, on 30th June, was a much bigger event when Koroni hosted several other dance groups from around the area. The dancing took place on a stage in the school yard and there was complementary home-cooked food and wine for everyone who came to see the show. This time my blue outfit, with a very elaborate head-dress and pinned white scarf, was typical of the island of Lefkas/Lefkada. On 5th August we were the guests of Messene when we performed in the little amphitheatre in the central plateia. 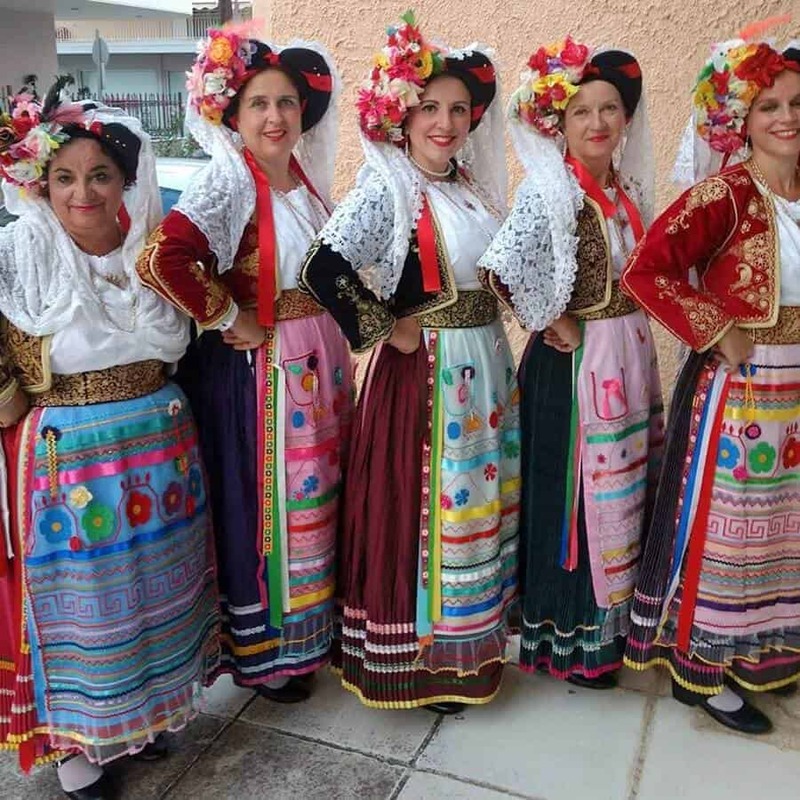 The colourful, flowery costumes this time were from Kerkyra (Corfu). We had to learn a few new dances rather quickly for this performance – specifically the women-only dances at the beginning. The first set of dances were from the Ionians. 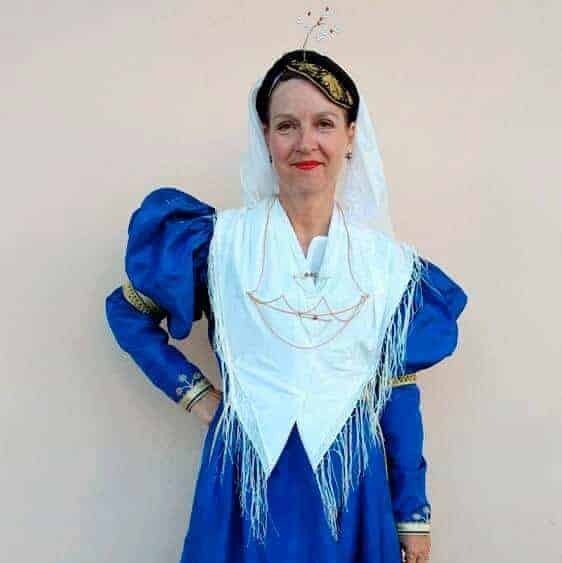 We had a rather quick costume-change half way through the evening – for the second group of dances from the Aegean – when I swapped my Corfu florals for a long blue costume from the island of Kalymnos. For those who are interested in more dance videos – I tend to post them after performances on my personal Facebook page, which seems to have become a bit of dance library! Very impressed with your work! Keep it up!